Have you ever forgotten a close friend’s birthday, because you haven’t marked it on your iPhone calendar? Well! This is quite common considering your busy schedule would force you to skip such important events, and what if you have accidentally deleted your iPhone calendar? Well, learning how to restore iPhone calendar from iCloud would come in handy for this situation. Here in this article we are explaining how to to backup and restore iPhone calendar using iCloud. For backing up your iPhone calendar to iCloud, you need to first setup your iCloud settings on your device. Without which creating a backup won’t be possible. Once you update the settings, new events on your iPhone gets synched with your iCloud. 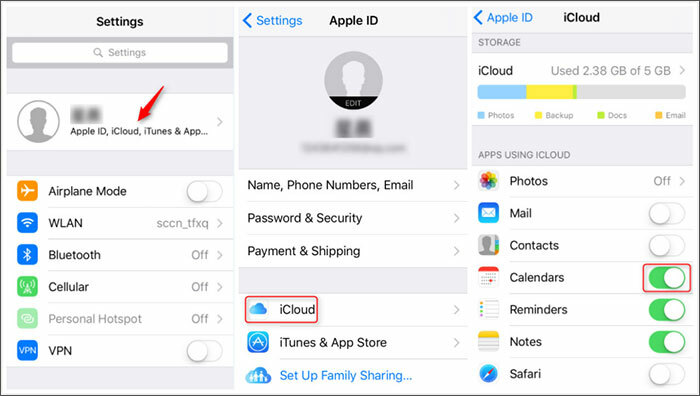 Here are the steps that show how to backup iPhone calendar to iCloud. Step 1: On your iPhone main screen click ‘Settings’ app, then hit [your name] on the top and tap on the ‘iCloud’ tab. Step 2: A new window with multiple options including the ‘Calendar’ tab will appear. Toggle the bar against ‘Calendar’ to ‘ON’. Step 2: As soon as you do that, there will be a message saying ‘Turning on Calendars’ on your iPhone screen. It will sync your iCloud and iPhone calendars. Now, click on the ‘Backup’ option and toggle the option ‘ON’. Tap on the ‘Back Up Now’ button to create a backup. You can also set a default calendar after setting up your iPhone calendar with iCloud, by browsing ‘Settings’ > ‘Calendar’ > ‘Default Calendar’. We have already explained how to backup iPhone calendar to iCloud. 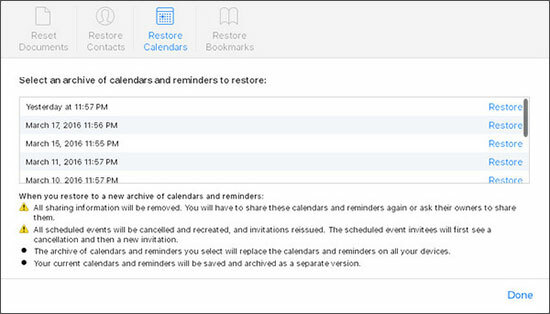 In case you haven’t achieved the desired result in restoring iPhone calendar from iCloud, here is your savior. 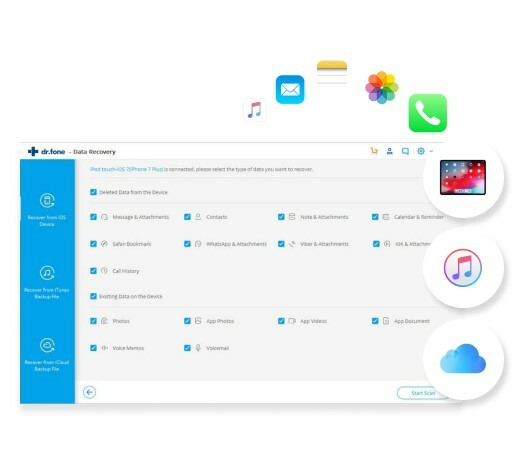 iSkysoft Toolbox - iOS Data Recovery would not only restore your calendar from iCloud backup, but also extract entire data from iCloud/iTunes backups. It will enable you to read the data as well. Apart from that you can preview the data before the recovery process is initiated. You can preview and then restore iPhone calendar from iCloud as well as from your device and iTunes backup files. 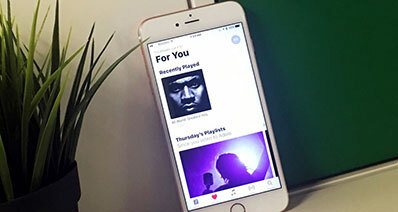 The 3-step process to restore iPhone calendar and other vital data from iCloud, iTunes or iPhone involves scanning, previewing and then restoring the data. It is compatible with 20 plus file types on your iPhone for data recovery. It can recover lost data from your iPhone, irrespective the way you have lost it (factory reset, iOS crash, passcode forgotten, locked, water damaged etc.). 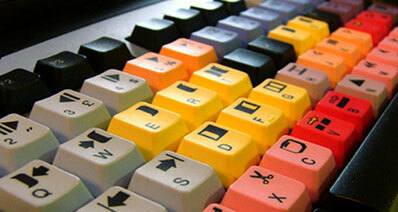 This software can smoothly run on a Mac and a Windows system as well. Here in this part of the article, we are going to restore iPhone calendar from iCloud. Follow this step-by-step guide. Step 1: You need to have iSkysoft Toolbox software on your computer, then install and launch it. Now, select ‘Data Recovery’ tab and then select the ‘Recover from iCloud Backup file’ option from the left panel. Now please sign into your iCloud account. Step 2: From the list of iCloud backups, click on the desired backup file containing your calendars and then tap the ‘Download’ button against the backup file. A popup will come up with a set of data types onscreen. In this section, you have to ‘Calendar & Reminder’ under the ‘Memos & Others’ section. Click on the ‘Next’ button right after selecting the data types. 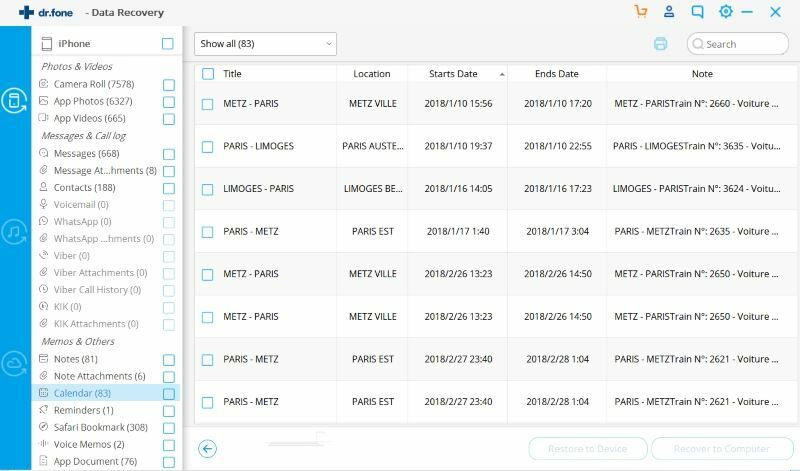 Step 3: Once the scanning process gets over, tap on the checkbox against ‘Calendar’ from the left panel of the interface and then preview the data. Select the desired calendars and then press the ‘Export to Computer/Mac’ button. The calendars will be stored on your computer. You can restore iPhone calendar from iCloud directly. Though, there are some disadvantages of this method. They include – restoring an earlier version of calendar will erase any shared data. 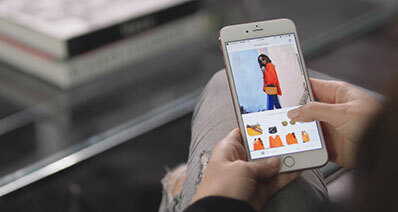 All the upcoming calendar entries and scheduled events will be recreated by iCloud and the invitations will also be resent to the person you have shared them earlier. Here is the step-by-step guide for restoring iPhone calendar from iCloud. 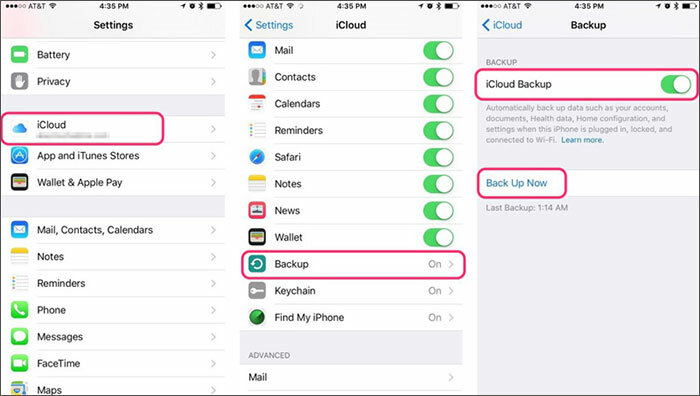 Step 1: Make sure that iCloud backup has been turned ‘ON’ in your iPhone settings. 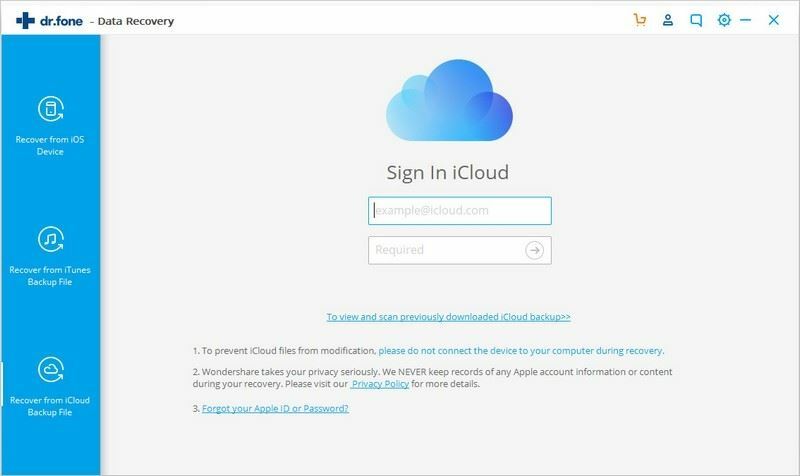 Go to your computer and browse for iCloud.com. 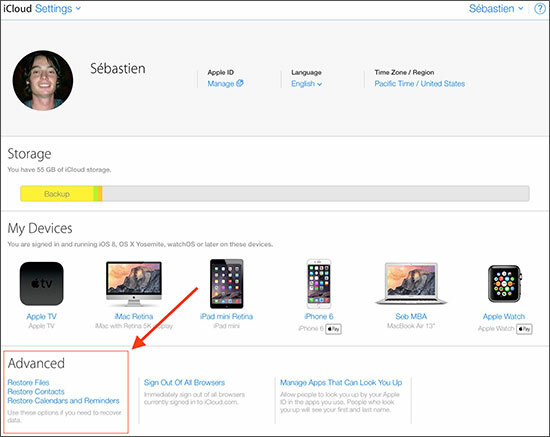 Now, log into your iCloud account using the same iCloud credentials that your iPhone has been setup with. Step 2: After logging into iCloud.com, tap on the ‘Settings’ app over there and then a new page will open. 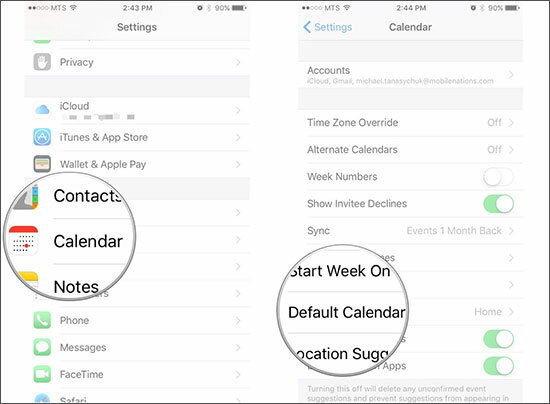 Go to the ‘Advanced’ option at the bottom of the screen and tap ‘Restore Calendars and Reminders’. Step 3: Now, a popup will appear and you need to hit the ‘Restore Calendars’ tab here. Select a desired backup from here and then click ‘Restore’ against it. Again you will see a popup asking for confirmation. Tap the ‘Restore’ button on that popup and let the calendar restored to your iPhone. Step 4: When the restore completes a notification will be sent to iCloud along with and email to the registered email linked to your Apple ID. You shouldn’t make any changes for your calendar or reminders during the restore process, as they aren’t changed or saved on your iPhone.